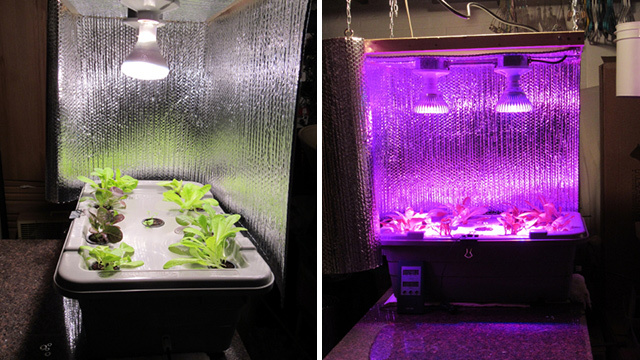 "I could not be more pleased with the Mini-Farm Grow Box. I started three varieties of lettuce in the net pots in my seed starting area using a recycled clear plastic lettuce container. As the seed sprouted and started to grow, I built a light fixture out of 2 X 2 lumber, electrical boxes and metal conduit to mount two LED grow lights. I positioned the grow box on a kitchen island table that I was not using in my basement & hung the light fixture over it. I added the pre-started plants and wrapped the light fixture and grow box with foil insulation to keep in as much light and heat around the plants. After three weeks, I thinned out the extra lettuce plants and enjoyed my first harvest from the grow box. As luck would have it, there is room for an additional two more grow boxes on the island table and I plan to fabricate those grow boxes myself along with an expanded light fixture to cover the two new boxes. Thanks Mike for creating & teaching us about this great system. It is very rewarding growing your own food."